Tsige Meshesha shows off spices and other ingredients for sale at Nile Grocery. 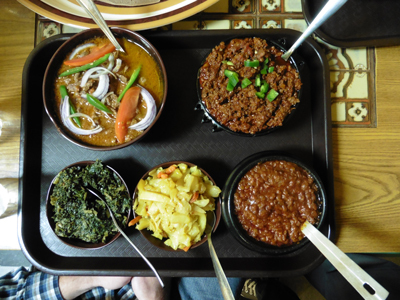 In an unassuming East Charlotte shopping strip, tucked in the back of a mom-and-pop grocery store, you can find a most welcoming Ethiopian eating experience. When Tsige Meshesha emigrated to Charlotte, her son Nolawi was just four years old. “I baked injera bread to sell to our Ethiopian community,” she remembers, “so I could stay home with my son.” Husband Zerabruk Abay, a textile engineer, hoped for work in this longtime textile manufacturing region but found mills closing. So the couple opened Nile Grocery in 2005. Doro wat, a thick smoky stew with chicken legs and hard boiled eggs. Beef tibs: sauteed meat in broth with colorful tomato, onion and jalapeno slivers. Stewed lentils with Ethiopia’s distinctive deep red berber spice. Cooked greens that mix collards, mustard greens and spinach. Tsige dollops everything onto one big plate of injera bread. Then you grab small pieces of injera and scoop away — no forks or spoons unless you request. With just four booths and a couple of tables, it feels like eating at home. You might see Nolawi dropping by on a visit home from East Carolina University. Or son Christian and schoolmates studying homework for South Charlotte Middle School. Or a Somali neighbor sitting down for a cup of coffee. Posters near the door note community events at Charlotte’s small Ethiopian Orthodox Church which meets a mile or so up Sharon Amity. Be sure to ask for coffee afterward. 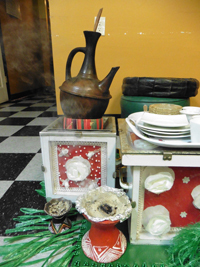 Tsige lights incense and wafts fresh-roasted coffee beans, then pours from a traditional jebena clay jug. A wedge of slightly sweet ambasha bread, plus a basket filled with crisp popcorn, encourage you to linger, nibble and chat. 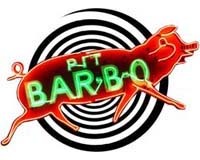 Monday – Sunday 9 a.m. – 9 p.m.
3113 N. Sharon Amity Rd. near Albemarle Rd.